Designed for exhibition at the Salon des Artistes Décorateurs. Desk shown at the Fondation Cartier in an exhibition featuring MDF; purchased by the French Fonds National d’Art Contemporain in 1988. Created in 1986 by Elizabeth de Portzamparc, this desk is called the 24 Hour Desk because of the many different ways it can be used. The small model can serve as a console in a living room or a bedroom, but can also be turned into the perfect little desk, or even a dressing table. The large model has the dimensions of a real professional desk. 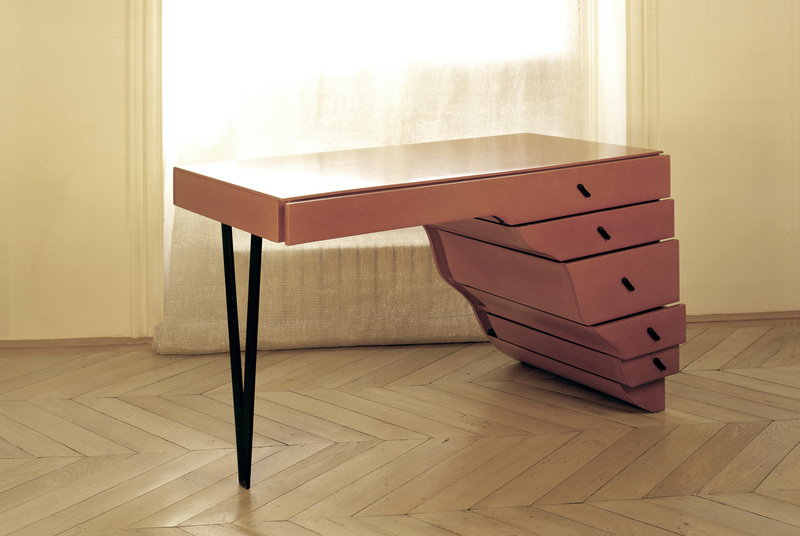 Both versions were designed to include important functional qualities: more (many) drawers, and even different shapes. And surprisingly, all that fits within a rectangle and a very open curve, where the drawers appear to be floating. The overall effect of the design is one of a desk that barely touches the floor. Varnished or painted molded MDF (medium density fiberboard). Burnished and varnished metal leg and knobs.